August 23, 2017  Presidential envoy Jared Kushner arrives in Jerusalem to take another attempt at restarting peace talks between the Israelis and Palestinians. But relations have gotten even worse recently. July 25, 2017  It remains to be seen whether Muslim worshippers will accept the "advanced technology" that Israel plans to implement in their place, after days of protest over the security measures. July 14, 2017  Three Israeli Arab attackers killed two border police officers before being shot and killed in a gun battle at Temple Mount. July 12, 2017  President Trump has tapped his attorney, Jason Greenblatt, to help him negotiate the "ultimate deal" for Israeli-Palestinian peace. We look at whether he can succeed where many others have failed. June 21, 2017  Jared Kushner and Middle East envoy Jason Greenblatt are in Israel to try to restart Israeli-Palestinian peace talks. Steve Inskeep talks to Yossi Klein Halevi, a columnist who met with Greenblatt. June 10, 2017  The 1967 war changed lives forever. After Israel's victory, an American student saw a biblical promise fulfilled. 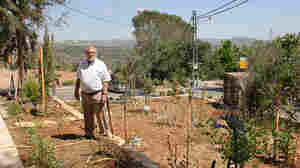 He moved his family to the West Bank — but their pioneering life came at a price. June 10, 2017  After the war, Omar Omar was stuck in Jordan. He made a new life in the U.S. and sent back money to help his family. Now when he returns to the West Bank, where he was born, he sees it as an outsider. 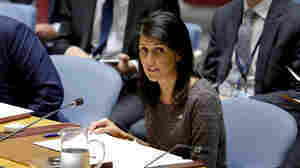 Nikki Haley Visits Israel, Talks Down U.N.
June 8, 2017  U.S. Ambassador to the United Nations Nikki Haley is on a three-day visit to Israel, promising her hosts that the U.S. will protect Israel from what she called "anti-Israel bias" at the U.N.
June 6, 2017  "It is essential that this council address its chronic anti-Israel bias, if it is to have any credibility," U.S. Ambassador to the U.N. Nikki Haley said and noted human rights abuses in Venezuela. June 4, 2017  This week marks the 50th Anniversary of the Arab-Israeli Six Day War. Michel Martin speaks with Jane Eisner, editor of The Forward, about Israelis' feelings toward marking the event. May 22, 2017  Trump is the first sitting U.S. president to visit the Old City of Jerusalem, seized by Israel in the Six-Day War a half-century ago. 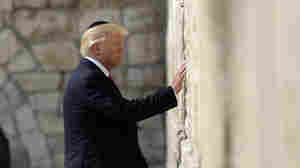 President Trump visited Christian and Jewish religious sites. 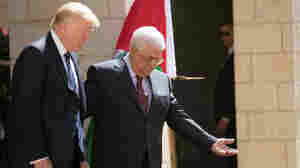 May 3, 2017  Palestinian Authority President Mahmoud Abbas will visit the White House Wednesday. 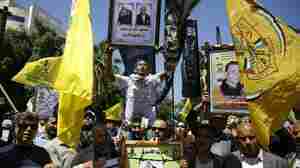 NPR's Steve Inskeep speaks with a former adviser to the Palestinian Authority, Ghaith al-Omari. April 17, 2017  Imprisoned Palestinians are staging a mass open-ended hunger strike to protest their conditions. It's being led by prominent Palestinian political figure Marwan Barghouti.